BS Broadcast to buy and sell used equipment in Middle East. Dubai, September 2018: BS Broadcast has established itself as the first company in the Middle East to deal in the buying and selling of quality-tested used broadcast and satellite equipment. Strategically based in the UAE, to facilitate easy shipment across the globe, the company is keen to engage with TV and radio stations, earth stations, satellite uplink providers, OB/SNG service providers, production houses, media training centres, government and educational institutions that lack the budgets to buy expensive cutting-edge solutions but still require reliable high-grade production, broadcast and satellite equipment. The company has worked to establish an inventory of over 650 products from 69 market leading manufacturers including Advent, Comtech Xicom Technology, Communication & Power Industries (CPI), Ericsson, Harmonic Inc, Norsat and more. 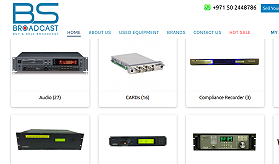 These products include an extensive range of HD/SD equipment such as video converters and servers, satellite antennas and terminals, modulators, frequency converters, multiplexers, HPA, SPG, waveform monitors, upconverters, routers and switchers. Each item has been rigorously tested by BS Broadcast's in-house engineers to ensure quality and the company offers a 90-days warranty on every sale. Orders can be placed via the BS Broadcast website, or directly with the sales team. Additionally, potential customers will be offered a trade-in programme, allowing them to trade-in their existing equipment for exchange or discounts. Explaining his organisation's business model, Irfan Gondal, CEO at BS Broadcast said: "While the Middle East and Europe enjoy rapid technology refresh cycles, organisations in regions such as Asia and Africa don’t always have the financial capacity to purchase the latest equipment. Buying and selling of used broadcast and satellite equipment is a well-established practice in the USA and UK but is a completely untapped market in the Middle East. We are stepping in to address this gap and are ready to meet the needs of smaller customers who still require quality solutions." There are other reasons why the trading of pre-owned broadcast and satellite equipment makes sense. "Often manufacturers stop supporting their older models which makes spare parts for otherwise good equipment hard to come by. This is something that we address by having such a comprehensive inventory. Furthermore, not all electronic equipment is easily recyclable. So, by refurbishing and extending the life of old equipment we are doing our bit for the environment," Gondal added. BS Broadcast has already seen a highly positive market response in Egypt, Iraq, India, Jordan, Pakistan, Afghanistan, the Philippines and Turkey and is looking to further extend its portfolio of solutions through partnerships with European and American used equipment dealers.